one of the best albums you'll hear all year. In 1987 Jason Becker released his first album, Speed metal symphony as part of the duo Cacophony with Marty Friedman. They released a second album before breaking up and Jason Becker then went on to release several solo albums. Then in 1996 he was diagnosed with amyotrophic lateral sclerosis (ALS) – also known as Lou Gehrigs disease and Motor Neurone Disease, an incurable, degenerative and fatal condition. Most sufferers have a short life expectancy – under five years, with less than 10% surviving more than 10 years. Over two decades on, Jason Becker is defying the odds and still making music. His condition means he can’t make music in the conventional way – he lost the ability to play guitar or even talk many years ago, but he uses a system where a series of eye movements lets him spell out words as well as musical notes and chords. His team then enter these into a computer and edit them to his satsfaction before generating charts to be played by session musicians. On this album there’s a whole host of world class musicians including Joe Bonamassa, Steve Vai, Joe Satriani, Marty Friedman, Paul Gilbert, Uli Jon Roth, Neal Schon, Steve Morse and many more. Jason Becker also appears playing guitar thanks to recordings dating back to the 80s and 90s. It’s not just guitar gods though – there’s also Cello played by Hiyori Okuda and Violin played by Glauco Bertagnin not to mention ukelele and harp. The sheer amount of effort that must have gone into creating this album is staggering – for Jason Becker to create this music and laboriously communicate it via eye movements is a level of dedication few have. 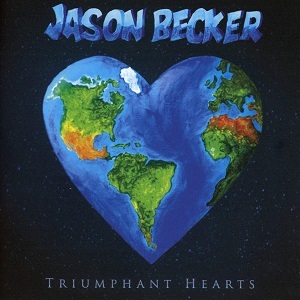 The fact so many high-calibre musicians appear on the album shows that Jason Becker is an extremely talented songwriter – if the songs weren’t good then those musicians would have been relucatant to appear. The album opens with the title track, “Triumphant heart” which is more a piece of classical music than a rock song. It’s not what I’d expected at all from an album written by a guitarist and packed with guitarists as special guests. Having said that, it’s an amazing start to the album – an absolutely beautiful piece of music. The electric guitar does feature prominently for a short period three-quarters of the way through, but I still regard this as classic music, just a modern piece of classical music that includes an electric guitar alongside traditional orchestra instruments. The first track released from the album is the nine minute epic, “Valley of fire” which is a track fr guitar lovers – just take a look at the list of guitarists performing on the track for a start. For a track to have that many A-list guitarists and to be that long it’s got to be pretty damn good, and it is – in fact it’s totally deserving of the “Epic” term in more ways than one. It’s an amazing track. The first song on the album to feature vocals is “Hold on to love”. It start off with a guitar solo and I was expecting it to be instrumental, but then the vocals start. It’s an autobiographical song and it’s powerful for that. Jason Becker said “I had to tell my story, to explain how I can continue living without feeling hate”. The gospel choir really lifts the song up too. This truly is an amazing album. It’s mainly instrumental, and that’s something that would normally put me off, but this is so well written and performed that it’s an album that I’d be happy to listen to on repeat for hours on end (in fact I’ve already done that for the last few hours). Don’t buy this album because you feel sorry for Jason Becker – buy it because it’s one of the best albums you’ll hear all year. A true masterpiece that has to be one of the best albums I’ve heard all year.